Over the next two weeks, as the summer comes to a rapid close, I’ll be frantically preparing for the next school year to start. If you’re a teacher, you already know that the summer is not really completely free. During the summer, we prepare for the next year in various ways: by professional development, by study, by organizing paperwork, by planning classes, and on and on. I’d also say that the relaxing that teachers can do during the summer also helps prepare them for the next year! So summer is a time of preparation for the teacher, and though I am not always as diligent as I should be in this regard, I do at least attempt a modicum of preparation for the next year. This summer, I have something different to prepare for – something I find kind of exciting! After a couple years of “subtle suggestion,” I was asked to teach a Needle Arts class in a local high school, as an elective. It’s not easy to convince schools today that some aspect of the Needle Arts can be (and should be – but I suppose this is debatable) a legitimate part of the fine arts curriculum in school, at least as an elective. It’s easier to convince private schools, anyway, and so… voilá… the deed is done, and I am teaching a Needle Arts class this year. It’s an experiment, certainly, but if it goes well, there may be a possibility of expanding. It works out half-way well for me. I’m pleased as punch to be asked to teach the class. But then there’s the lazy side of me kicking in… My other teaching job is all in the morning – I’m out by 12:30 pm each day – but it just so happens that the elective block that the Needle Arts class will fit into is the Last Hour of the Day, every day. I haven’t taught the Last Hour of the Day in years! But still – this is great for traveling between schools; there’s certainly plenty of time to get to class and to do some pre-class prep every day. So, in the background for several weeks now, I’ve been working on preparing a year-long course in Needle Arts. I’m excited about it! I’m sure I’ll revisit the topic off and on during the school year – but I’ll try not to bore you with it! What do you think, anyway, about Needle Arts being a legitimate part of the arts curriculum at a school? I’m not talking about needle arts as a small segment of a “craft” class, but a real, legitimate, hands-on course in Needle Arts…. Do you think it has a place as at least an elective? What do you think would be especially beneficial about it? What do you think it should encompass, topic-wise? I’d love to hear your ideas on this!! Leave a comment below, and let’s discuss the topic! How wonderful! I think it’s a great idea. Needlework is a craft your students can practice for the rest of their lives. No matter how much drudgery is involved in their workaday life, if they have needlework at home (or in their bag next to their desk), they have a creative outlet. Additionally, needlework has been an intrinsic part of education, at least for girls, for millenia. They are joining the great sisterhood of stitchers when they pick up their needle and thread. Good luck, and I look forward to hearing how the class goes. Wow…. What topics can be covered in a Needle Arts Class? History, Math, Art, Science, Geography, just to name a few. They could all be incorporated over a years time. Sounds wonderful to me. Good luck Mary and it sounds like this is a great adventure for you. I think it’s a fabulous idea! I have offered to teach units at our high school with various home ec teachers over the past 25 years. None of them have responded positively, which makes me very sad. Three of my daughters took home ec at the high school and learned very little. The one daughter who didn’t take home ec sews, spins, weaves, knits, and crochets. I wonder what that says about our home ec program? I think a needlearts elective is a wonderful idea. There are so many young people today who dont know how to do any of the needle works. I had family to teach me when I was growing up, but with mothers working nowadays,needlework takes a back seat. We are going to lose all our great needlearts if we dont teach our youth. That is just so awesome – I wish they had that class when I was in school. I did take four years of sewing (in the early 80’s), and was constantly told what a waste of time it was by teachers and my parents. The only person I have ever known to be taught any type of needlework in school is my sister-in-law. She grew up in a little town in Guatamala and had frequent classes in it, but hasn’t touched it since. I’m looking forward to hearing what you are going to do with the class. Finally – needle arts are being taken seriously. I have studied art history at the college level and was very disappointed to learn that needle arts (or textiles) are not part of the art history curriculum. Not only does this exclude an important art form from the course of study, but it also minimizes the contribution of women to the arts. I believe it is an excellent idea. I think we need to bring back Home Economics and restore those things that our parents or grandparents participated in. Sewing, in all forms, seem to be disappearing and cooking, well all of us eat and to train our children is a good thing, in all things. Keep us posted as to how the class is progressing. I’m excited to hear about this class. Yes I think this is a valid class for fine arts curriculum. I taught middle school for many years and one of the things I did was teach a class that incorporated reading, history, and a quilting project. There is so much history that is associated with the arts and needlework was very much a part of that. Certain tapestries, designs and even needlework tools are associated with specific eras and as you know some things are becoming lost arts–tatting, bobbin lace, etc. Many of these forms of art were the only types respectable women could do since it was frowned upon for them to do painting and sculpting. Needlearts was the woman’s venue for artistic expression. Needle Arts should definitely be part of a school curriculum (as well as other “forgotten” arts). Since I began homeschooling my son and daughter (13 and 11 now), we have included a needlework project or two every year that ties into the material we’re studying in history. No complaints from either child—they love these hands-on projects—and their friends are intrigued as well! I think its a fabulous idea. At school as librarian I was often encouraged to try something of the sort but never given any time to do it, except at recess or noon hour. Use of colour and line would be two topics to explore, not to mention use of fibers in all its differnt incarnations. Wool for stitching or knitting, cotton for stitching or woven, exploring all the different textures and uses of the end products. I think any Needle craft whether it is teaching someone to stitch on a button properly to embroidery or stump work should be an essential part of the school day – as important as using a pen or a keyboard. Some people may hate it and come to it later in life, some may just find a corner of the day where they can stitch while letting the hurly burly of life just go over their head but it beats a Gameboy into a cocked hat! Home Ec was the only course we were offered, but the handwork from crochet to embroidery was my favorite part of the class. Learning to machine sew was more of a necessary evil. I love sitting around and doing things while I visit with friends or watch TV and such. I’m jealous of your students. It will be so fun. I love reading your column because of your enthusiasm, hints and it feels like a visit with a friend. Your students are VERY fortunate – and not just for the creativity – handwork is so therapeutic and helps me relax, and so many these days will never learn that…. HAVE FUN!! What a wonderful opportunity! I can’t wait to hear about what you do. Think not just in terms of the actual needle arts you can teach them, but what an opportunity it is to do some interdisciplinary work incorporating history and even (perhaps) a bit of Women’s Studies. Items which come to mind immediately for me are the samplers which young girls made; the work in one blanket by multiple women in quilting bees; with knitting, the socks and other items made for soldiers during various wars; the traditions of fisherman’s sweaters; the home-based industries that women had which helped support their families; the effect of the industrial revolution on those industries; the history of men in the needle arts (particularly in the British isles in knitting); ethnic traditions and how the modern age has impacted those (indigenous people in Canada having their works, motiffs, etc. copied/stolen); and the expansion of needle arts into the fine art realm (think of installations involving fiber arts, etc. the Museum of Arts and Design in NYC would be a good resource.) I guess that was more than a couple ideas LOL. ohh! i think its wonderful!i dont know about in the u.s.a but here in quebec its a lost skill. (cross stich is almost the only form of embroidery practiced and not very much)so i think its very exiting to know that young people learn about it. have fun this year mary! WOW!!!! The class is sure lucky to have you for their teacher. I am so happy that you will be doing what you so obviously enjoy. Please keep us updated on what you do teach. Hi Mary, can I come to your class? It sounds like so much fun. I think a fascinating unit would be on ethnic embroideries, how people have embellished their clothing around the world. Then you could have uses, ecclesiastical, interior design, domestic, laundry marking, samplers! Then there are techniques. I hope you share what the course will be. I wouldn’t be surprised if there would be people interested in taking it who are not in school any more. Yoou are to be commended…Our youth need to learn the crafts of their ancestors….Wish I had paid more attention when I was younger. Keep us posted on the progress. I am a teacher myself (middle school math) and love the idea of an elective needle arts class. For many kids, school is the only opportunity they have to be exposed to creative endeavors and develop those skills. Beyond learning the art, I believe needle arts as a class can help kids develop self-discipline, attention to detail, confidence, pride in a completed work, self-worth, and broaden perspectives. Just think of the opportunities to see history, math and the written word in a different way! You are so right that teachers do not really have summers off. I’ve been in and out of my classroom all summer getting settled into a new room, labelling and sorting new textbooks, putting up bulletin boards,and planning lessons. I do, however, love the flexibility and the fact that I can choose what to do when depending on my frame of mind that day/hour/minute! Have a great year. Love your site! Wow the possiblities! You are so lucky, as well as the students. Needle Arts are such a wonderful part of our history. I recently downloaded a free ebook called English Embroidery and was immediately engulfed. The beautiful works from the Royal Needle Arts School, as well as Queen Elizabeth I. I thought to myself someone needs to keep this history alive. What better way than this, teaching the next generation about this beautiful art. You go girl! I don’t see why other common arts classes (I recall Ceramics, Band/Jazz Band and Introduction to Drawing/Art at my school) would be valid and needlearts not. Of course, you’re talking to a rather biased audience. I’d love to know what kind of ground you plan to cover. I can only imagine the diverse and comprehensive curriculum students would get from quite possibly the most knowledgeable needlearts blogger out there. I think it would be fantastic. I know I would have taken it if I were given a chance. I’ll be interested to hear more as the year progresses. What a wonderful idea. I hate the way needlework knitting crocheting has lost it’s way. I would love to see kids get hooked on something other then gaming. I still remember my first taste of Swedish weaving and learning to knit and crochet st 8 years old. The desire has never left me. Hi, Mary. What a wonderful opportunity for both you and your students. Most of the comments posted mentioned needlework and the opportunity to teach about its history. I would include art education. This is such an opportunity to begin your student’s education in design principles, and beginning to work on creating their own designs. To me, a good portion of the pleasure of needlework is knowing that the design is my own. All design comes from the heart and so there is real satisfaction knowing that you are expressing yourself. And what opportunities do most kids have today to express themselves? Needle Arts in school. How wonderful ! I took music in school, playing a bassoon for 3 years and probably could not play a note today. But, what I did learn was an appreciation for classical music. Today when I listen to an orchestra I can tell the difference between the sound of a clarinet and a oboe. I imagine a Needle Arts class that not only teaches the execution of a perfect french knot and a beautifully curved outline stitch but the appreciation of all things that come from the needle. I firmly believe that things that are not understood are not appreciated. What an opportunity to teach not only basic needlework skills, but how to identify the different kinds of needlework, the tools used to make them, the way to execute those skills, and on and on and on…. What a wonderful chance to teach students not all needlework comes from a kit; they can design their own work, do it in the threads and stitches THEY choose. When people love something they collect it and will preserve it for the next generation. Who knows you may be the teacher who sparks an interest in textiles of a student who will be the next curator at the Smithsonian Institute or the next William Morris or a woman who is never bored and fills her life executing lovely embroidery. One thing you will do is raise the level of appreciation of all textiles. What an exciting opportunity for you to pass on your passion. I think this is a wonderful idea!! Needle arts will include a lot of other areas (including history and math) and open up a world perhaps not otherwise available to some students. My interest in embroidery as a 10-year-old was encouraged by a neighbour lady and I’m pleased so say that on her 50th wedding anniversary I presented her with a hardanger/cross stitch /silk ribbon embroidery sampler with a note on the back of the framed piece thanking her for helping me to begin to learn some stitching arts so many years ago. Speaking for myself, the encouragement given to an interested 10-year-old turned into a life-long passion (obsession . . .) for the various needlearts and at nearly 60 years old I’m still learning. I sincerely hope that your experiment has a similar outcome for the majority of your students. With it being offered as an elective course, most students will already have a spark of interest which should make teaching such a class a pleasure. applause to you, Mary the Needle work teacher! I think that is a wonderful idea. I wish all schools taught what we used to call Home Ec. Growing up in Toronto back in the 40’s & 50’s our school was kindergarden through grade 8 and the last two years – grades 7 & 8 – we used to walk to another school that had the equipment and we were taught both cooking and sewing. No fine needlework but at least there was some hand sewing involved. I have a funny story to tell you. I had 2 older sisters 5 & 7 years older then me. I started to get interested in clothes around grade 8 and used to sneak my sister’s clothes when I could. One day a newspaper photographer came to our home ec class and took a picture of me hand sewing. My picture was published in the Toronto Star and my sister saw it and screamed you are wearing my good blouse. She put a lock on her closet and that ended that. We laughed about it for years. I think a needle arts curriculum would be wonderful! It could be combined with American History. 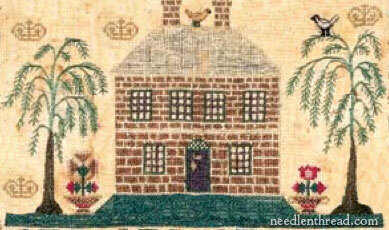 School girl needlework was important in the life of colonial women. There will be a new exhibit on Betsy Ross at Winterthur museum this fall. Betsy did far more than sew our first flag. She was also a successful needle woman and upholsterer. Philadelphia and many other coloniial cities had advertisements in local papers for needle work schools. Many young colonial women attended these schools as their only means of education. Coordinating a formal needlework class with an early American history course would be great. Even if it started off as as extra credit project for a history class. It is truly interdisciplinary. The class can study Betsy Ross, Abigail Adams and other “founding mothers” as they learn the art and importance of needlework. There is a new book out on Betsy Ross which I believe is available through Winterthur’s book store. And didn’t Cokie Roberts write Founding Mothers? I also learned that men on ships had a basic need to learn needlework to mend sails, etc. There were thimbles designed for this purpose. If a sail was damaged at sea, it had to be mended. I think this is a great idea!! Band Sampler’s are always popular! This has unlimited possibilities. This sounds wonderful! Maybe teaching this class will give the students something more enjoyable then games, hanging out or doing nothing. I can see them going to the mall with a new places in mind to shop. Fabric store, needle art store or just buying this shirt to do some stitching on. I think doing anything like needle arts, quilting, scrap booking or even just reading. It gives people a chance to be alone with themselves. That they don’t need to be entertained by outside mediums all the time. It lets your mind wonder and dream! Needle arts can be taught as a spine on which to hang women’s history and the history of suffrage and women’s rights. You could bring in concepts from “No Idle Hands” to show women’s organization started with service oriented needlework groups; and even veer off into the needlework-as-oppression thoughts of books like “The Subversive Stitch” – there’s plenty of academic discussion material between them both to bring up while the class is learning stitching techniques. It’s a great opportunity! Ditto, ditto, ditto! Mary, you are so fortunate that the school will even consider letting you teach an elective in needlearts! Most schools are cutting arts of any kind. I am a science and math teacher, and the arts are just as valuable a part of the curriculum as are any of the “core” subjects. So glad you are able to teach this class! What should it include? I would show the students some basic stitches and let them create! But that’s me….I like to “play”! Let us know how the class goes. I would love to know how the students like it. This is a blessing for so many students. I taught Home Economics years ago and the students made, among other things, stuffed animals by hand from kits. Many of the students still have theirs after 20 years. Needlework never goes out of style. You will be teaching them a skill that will last a lifetime. Go for it. Have fun. Can I joint the class ? Will you put your cours on your web site as a tutorial ? You can sign me in, please. I would love to be your student. Yes for Needle Crafts class to hand down the tradition. Students will be able to say that they did it by hand by themself without pushing a computer button. Great succes in your new project. Hey, Mary, Well, the University of Kentucky agrees with you. In the theater dept the students have to take costume design and construction. The professon, Bob Haven studied Japanese embroidery at the Center in Atlanta in order to make authentic costumes. He has hosted 2 or 3 trips for students to study, as well. And, the University of Kentucky is sponsoring a world exhibition of JE at their art museum next year. So, yes,I would say that needlearts should be included in arts studies, at least as an elective. As a teacher of Art, Craft and Design in the UK, Textiles is part of the curriculum at my all girls school for years 7 & 8. Year 9 it becomes an elective subject. Next school year there will be 76 students out of 180 who have elected to carry on with Textiles which covers embroidery,patchwork,feltmaking,dressmaking and mixed media work.I think we are in the minority but the students obviously want to carry on. The chance to study the subject should be there for all.Look forward to seeing how your classes go Mary. I hope the class will not be restricted to females. When I married my husband 48 years ago he some suit trousers with staples in the hem. Hem came loose and he had no idea how to stitch it. The USAF taught him to shine shoes perfectly and work on intricate electronics but no sewing! I am in favor of a stronger academics program in schools, after seeing what my children were offered. But they did all make it through college, so I suppose the curricula weren’t too soft. Needlearts, especially combined with history, certainly could be a great elective, probably more useful than ceramics. Although I do have quite a few nice bowls and cups my youngest made in high school. Then there is always the potential for incorporating engineering into the classes. You could talk about tensile strengths of different threads, mechanics of fastening techniques, why fabrics shrink, and on and on. I can’t wait to see what you’ll be teaching. I think it’s a great idea! Our middle school here in my hometown was losing it’s home arts teachers to retirement and funding, so the kids are losing out on a lot!I recommend changing some of the cirriculuum from today and adding classes such as yours and other languages,sign language (and the history that was avoided or left out). I wish we would of been taught how to do samplers etc. when I went to school,long,long time ago!lol! I just love receiving your newsletter and hope to one day be able to make the beautiful things I see on here! Thanks! Mary, I think your idea of the needlework class is wonderful. I am 64 yrs old this month and I can remember some of the things I learned in school that changed my life forever! Especially in sewing, needlework, and the love of reading. I was just in grade school when I learned about embroidery, so I taught myself over the years. In this class you will change someones life! This may grow so much you will have to expand!! Congratulations, Mary. What a wonderful opportunity to give today’s students a taste of what we took for granted growing up. There are so many areas to consider- the many areas of embroidery, quilting, knitting, sewing, etc. And of course the history of needlework, both techniques, political implications and economics (Society Silk or the Deerfield Embroidery of the late 1800’s giving women a chance to earn money, or as described in “Women’s Work: The First 20,000 Years Women, Cloth, and Society in Early Times” by Elizabeth Barber. Can you tell I’m excited by this idea of yours? Since you’ve asked for suggestions, possibly the first semester could concentrate on a general overview of basic techniques, history, materials, composition, color theory, etc. Small projects could be completed for a variety of techniques. The second semester could be a “senior project” with each student designing and creating a piece in their technique of choice (think small quilt, embroidery sampler, knitted sweater), perhaps with a research paper describing historical and artistic influences? That would allow each student a chance to explore their favorites in more depth, and expose all students in the class to that technique in detail. Good luck, I’m sure that you’ll provide an awesome class! Oh my goodness this is SO cool!!! I would have taken that class when I was in high school! I work with the youth at our church youth group and I teach embroidery and tatting to them and there are so many who want to learn that I’m amazed. I think it’s neat that you are getting to teach a needle arts class! I think something that would be neat to have part of the class is how to create your own piece and not just work on a ready made kit. (so many get stuck in that thinking they can’t branch out on their own) The other thing I would think would be important is to explore as many types as possible lots of little projects that can be accomplished. What a feeling it is when we have completed pieces!!! This is so cool I’d love to hear how your class goes through the year! Oh, Mary, that was my dream for many years. Needle Arts should definitely be a “real” class and the students would learn much more than needle and thread – patience, quietness, and focus just to mention a few. I taught for 23 years – English in high school. I can’t wait to hear your reports – both good and bad which I know you will have both. The students are so lucky to have you. I was taught to embroider when my elementary school was on half day schedule in the early 50’s and in the third grade a parent came to the school to teach in the afternoon after our morning school. I am indebted to that lady for beginning my love of stitching. I think it’s wonderful that you are doing this and I hope you report on how it goes as many times as possible! I worked in a UK primary school for a while and find it shocking how much emphasis is given to ‘academic’ areas. Being able to do things with their hands often enables less academic children to shine! Do you know ….. the most rewarding thing I ever saw was when I was a Cub Scout Leader and took my Cubs to a District Fun Day. Another leader had an activity where she taught a little bit of lace making, the aim being to make a little snake book mark. Now, this was in the days before there were many girl Cubs and I didn’t think my boys would be interested. However, I had a go and loved it ….. as did one of my Cubs that could be easily described as a ‘challenge’!! To my total surprise, he sat there for ages with amazing concentration ……. he WAS going to make that book mark! His face when he had completed it was a picture! I think needle arts should be listed as a elective at schools I think it is a great learning experienence. The history of needlework is important to learn. When I was in school the only thing that was offered was home ec. If it took as long to sew a dress as it did in home economics I would never have sewn. No other needleworks were taught I had to teach myuself embroidery and Quilting. Fortunatley I had a grandmother who taught me knitting and crocheting. Getting me started in needlework. The Status Thimble owner, Susan Bryant, in Burlingame, CA teaches different projects and combines it with history stories. She has a wonderful knowledge of history and talks about it while you work on your stitching. If you could team with a history teacher and talk about the Pilgrims’ lives and the Revolutionary War or even European history. She did a wonderful class on the Bayeau Tapestry. Would something with math work out? A class in Needle Arts definitely has a place in the curriculum. It can be a vehicle to study history and the various cultures; “engineering” by individual creative design; math by calculating design size, etc,; chemistry in the understanding of dyes; a study of fibers, fabrics–the possibilities are endless beyond the art aspect of composition and color. Needlework is an excellent, even essential component of fine arts. Would that someone had created the equivalent of the British Royal School of Needlework here on this side of the pond. The art world still gets antsy about determining that which is art, and that which is craft. I’m old enough to remember the controversy over Louise Nevelson’s major fabric installations. That controversy magically subsided for Kristo. All the quilt projects and community stitching efforts have, strangely, not helped in sorting out that which is “fine art” from that which is “decorative work” or “mere craft”. I think that’s when some people started saying “fiber arts” instead of embroidery or weaving or spinning or dyeing. Have nothing in your homes that you do not regard as beautiful; have nothing in your homes that is not useful. Studying Mr. Morris and other male artists who used fabric and thread as their medium or mediums may be important because he and those with whom he worked, knew the importance of such work, and remain the strongest spokespersons for needlework in the home, made by those who live there. I have heard that May Morris, William’s daughter, was, essentially, the inventor of the pre-packaged kit for home needleworkers. While others sold charts, Ms Morris and her fellow stitchers and teachers at Morris & Co. figured out how to design, package, price, and sell the home kit and “customize” with multiple colourways or techniques for the same design. A special section on Morris may also be useful in reinforcing the few boys who are likely to sign up from the start for a needlework class. Are the needlearts devalued because it was “women’s work”? Even in garment factories, even today, a “cutter” is usually a skilled job, reserved usually for men and higher wages. “Finishing” or “embellishment” are/were for women. If I were teaching needlework, I think I might include a unit on garment work — even the finest clothing makers depend on a piecework system, all the construction of heavily embellished clothing, no matter the age, was dependent upon piece work. Imagine if three groups of three had to make an embellished vest and sleeves? Could they design, plan, and embellish — and finish on time? And it would be a great opportunity to teach about sweatshop labour. I have a 14 year old nephew who is topping six feet four inches. He’s decided (for the moment) that it is his goal to be an artist, particularly an artist that uses fibers. He really hasn’t encountered any criticism for knitting and felting and doing some stitching, but then again, you can tell he’s very tall for his age and is also quite self-confident. He’s not in the Waldorf system, which emphasises knitting and weaving for the students, both boys and girls. No, in his neighbourhood, if he weren’t so strong minded and so tall, he’d be having real issues with his peers. Not different from my own views as to why I love stitching so much. Art is process, understanding, involvement, perhaps a mission, and sometimes merely for its own sake. It is about making a world that expresses who and what we are, and for people to have pride in what they produce with their own hands. I can’t think of a better thing to be teaching young people or a better means by which to do it. Fiber work or art can be inexpensive and thanks to modern technology one can choose whether, when, or where to emphasise the process. At the very least, it is about time. Taking time, making something with time, and using time wisely and well. Good luck with your new class! I think having a Needle Arts class in a school’s curriculum is wonderful. These skills are a very big part of the culture of Western Civilization and certainly an art form we don’t want to see disappear. With the new technology in machine embroidery, this could happen very easily. I salute you Mary. I think your ecclesiastical embroidery is magnificent. I think this is a terrific idea! What a great opportunity for your students! I think your students will love it. My high school kids loved learning about embroidery in fashion history and then trying it out on there own Clothes. I found keeping the suject relevant to the students age really helped thier levels of interest and needlework development! Good Luck, PLEASE keep us posted! I’m so excited for you, this is what I would like to do here in Oz too. I’d love to hear how you managed it. What was your presentation to the school etc. anything would help. Best wishes on your adventure. very satisfying about doing needlework. and I am a bit jealous! a wonderful thing for them to focus on at this time of their lives. Perhaps keeping a few out of trouble. I think it is a wonderful idea. I have just begun to learn to embroider and am enjoying your website immensley!! I printed out one of the patterns, copied it to fabric and began to stitch. I definitely need some practice but I am excited! I find that I can absolutely forget about the whole world when I am focusing on embroidery. Embroidery should be an elective, I imagine there are a lot of young ladies out there who would love it! that could open from this exposure are endless. I wish you and everyone involved great good luck. Sincerely, Pam Williams in Memphis, Tn. I think your teaching the Needle Arts in school is simply fantastic. I remember taking needlework in school and looking forward to that one day a week that we had the class and enjoying it so much. We always learned something new each lesson and had homework to practice, which was always done, and the teacher would critique it at the next class. She, like my grandmother, was a perfectionist and the stitches had to be just so. I made utility stuff and felt so proud when they got used in the home and Mummy gave me the credits. It really taught me to persevere and that perfectionism has stayed with me to this day. Although, it seemed difficult at times then, I look back on those memories with great fondness. It is things like these that help mould little minds and make a big difference in the future. Fibre Arts has a very important place in the schools and I wish more schools would be willing to include it in their curriculums. I would love to hear how your class is doing, so do keep us posted. Mary if it is an elective, and if the students want to take that elective it will be fantastic. Then the year 11 and 12 Home Economics students complained because I wasn’t teaching them ‘that Granny stuff’. You are going to have the most wonderful time. I think it’s a wonderful thing that you have this opportunity. I wish the needle arts were offered in all high schools as part of the arts curiculum. I believe they teach a person to reach for their own standard of excellence in self expression. I also believe that this excellence “spills over” to all areas of a person’s life. I know this has been the case for me personnaly. In attempting to achieve accuracy and excellence in my stitching, my mind is trained to reach for that same thing in everything I do and say. What a wonderful idea. I wish they had this when I went to school. To be able to teach our youth about the history of needlecraft, the techniques, the designs, the materials, oh what an endless supply of information. In our busy lifestyles, how nice for the students to be able to learn a relaxing pastime which can lead to a career. A skill that will stay with them for life. This can only be a good thing and I wish you every success with your teachings. Many years ago, schools in my country taught crochet, knitting, cross stitch, etc. Unfortunately, the school I attended was an American school; the only class not in English was Spanish as a language. We did not get lessons in embroidery of any kind. I saw the samplers my friends made and they were really something beautiful. All that is almost gone because other types of crafts are taught. So, hooray for you and the children who will be taught by a great teacher. Good luck! Oh, I would have loved to have this class in high school! I think it would teach concentration, patience, dexterity, dedication, plus knowing they were carrying on a beautiful tradition. When I was in my last year of high school (more years ago than I like to think about) I had an empty spot in my schedule, and not wanting to waste it doing nothing, I took a “needle arts” class. I had done home-ec in junior high school (do they still do that?) but didn’t get much from it. This class, though, taught me a bit of crochet, knitting, crewel embroidery, bargello, and a few things I’ve probably forgotten. I never looked back and have been doing needlework every since. Unless you have a friend or family member to get you started, that sort of class can actually be life-changing, as it was for me. I recently took a class in stumpwork by Jane Nicholas and now I have a new obsession! I hope your new class is a great success and gets a few new converts to stitching. I wish I was in that high school. Congratulations Mary, I think it is a fabulous idea. The nuns used to be good at teaching needlecraft but it was not for everybody. Over the years I met men that were good knitter but they were scared to tell about it. I wish every school had such a curriculum. I would promote creativity etc. Finally! At Last! This is the best news I’ve heard for…..uhm…..a while!! It is SO good for SO many reasons (as heard in the previous 62 comments)! I hope the idea really catches on among students, between schools, etc. And you are an excellent choice to lead such an endeavor! Go Mary! Needle craft does not have to be the old boring stuff of olden days. New contempory textile art I feel is a must. It is an extention of art and another way of expression. The basics can still be taught but in a more modern and interesting way. Many contempory artists use a variety of techniquqe and stitch is often chosen. look at Rozanne Hawksley’s work, even Grayson Perry has expressed himself in textile. A needle arts course in school is a great idea. It can be used as cross curricular with history courses and other art classes for learning color, design, perspective. Really, textiles are another medium, like oils or watercolors. Our stitching these days is ususally decorative; we don’t NEED the things we make, but it is certainly satisfying. As someone who is not particularly talented with a brush or pencil, I find needle art a wonderful way to express myself. I think a lot of young people are not exposed to the arts in general and a class discussing the history and development of a particular art is a great way to introduce students to culture. I feel the same way about music education; you never know what kind of latent talent there may be until students are exposed to the possibilities. You are fortunate that there is budget for something seen and unnecessary in today’s world where only math and science are getting new dollars. As far as your program, my favorite classes always have a balance of information (history, etc) with hands on experience (create a stitch sampler like a mideaval lady) learning the techniques at the same time learning about them. I’m very much looking forward to hearing about your new venture. It won’t be boring at all! Good Luck! I think it would be a great idea! I wish they had offered it in my high school. As a grandmother I am teaching my granddaughters but a lot of kids don’t have that option. I think needlecraft of all kinds plus knitting and crocheting and quilting should be offered. Good for you in getting this in your local school!! I definitely think Needle Arts has a place in the school curriculum. Good for you! Yeah! Mary, I love, love, LOVE this idea! I never took Home Ec., but I think one of your great strengths is your ability to communicate the principles behind the part I just abbreviated — the [Ec]onomics of self-expression (in this case, the economics of needlework). I hope you will encourage your students to think about the tradeoffs needleworkers (and everyone else) have to make between time, money, and the results of their labors. When you talk on this site about budgeting so that you can afford better equipment, better materials, and achieve better results, I hear undertones of some very practical life lessons, as well as some core academic concepts. I’m sure it won’t take much for your students to grasp the difference between the cost of silk and cotton — and the difference between what they can make if they take the “quick and easy” approach versus what they’ll get if they work slowly and carefully. Many students will automatically prefer to attempt “quick and easy”, which isn’t an invalid decision, all in all. Most students may automatically prefer to achieve results that are “slow and beautiful” — but won’t want to spend their allowances on silk and linen, nor will they automatically want to give up their free time to practice different techniques, rip out imperfect stitches, etc. Having a meaningful, if light (and value-neutral) discussion about the fact that individuals and businesses must make the same decisions every day would go a long ways towards helping young people understand the underpinnings of a whole raft of issues, from sweatshop labor to advertising’s role in manufacturing preferences for “trendy” versus “classic” clothing and other possessions. As so many others have suggested, I love the idea of encouraging students to create their own designs, but I hope you will also encourage students to pick their own materials with an eye towards forcing this lesson. You do such a good job on this site of encouraging us to yearn for quality, so I can only imagine you’ll do just as well in the classroom if you show students some of your own work and show the differences between quick projects worked in cotton and quick projects worked in silk. You can bring in more laborious projects worked in gold (be sure to get these out of their greedy teen-age hands and back to your home, lol!) as well as some projects that took a lot of time to research, design, and execute, but that didn’t necessarily cost as much to make. By talking about the decisions and trade-offs that led you to your beautiful results, I think you’ll be able to make strong academic points in ways that won’t make your students think they’ve been sitting in an Econ. class — but will go a long ways towards building their life skills and the “academic rigor” of your course. Only good can come of this Mary. My thoughts are to go easy on the History, especially up to their Great Grandparents era, and big on Colour. Colour is a huge subject in all it’s forms, from colour theory to breaking the rules. From trends to personal preferences. From embellishing existing or thrift shop clothing to wear or to the extent of hanging it on the wall as decor. Achieving the subdued colours of old samplers and intergrating parts of them into modern coloured wearables or asseccories, bags, belts, shoe decorations and hair clips, bands etc. I like that idea, which only came to me just now, of sections of old sampler designs combined with modern ‘stuff’ for assessories. Could do pincushions, pencil cases etc too. One for my ideas folder. No doubt it has been done before but ‘great minds think alike’ like the saying goes. No, I don’t know what I’m talking about. Just thinking ramblingly in text! I don’t think what I’ve written is really what you were wondering about but, like I said, just thoughts going thro my mind. I think it would have to be an elective. Nothing as disruptive or discouraging to the other students as someone who isn’t interested and doesn’t want to be there. I’d be very interested to read your boring, NOT, revisits to this subject. needlework (hand embroidering,crochet,rug making,etc)should definitely be offered from time one begins school and throughout college and beyond. i had spoken to our university about this; however, i was not able to find someone to teach. also, i have always wanted to find a teacher/teachers to offer classes out in the community. this is a very important and a very essential art that is beneficial to all. I think it is fantastic! This gives the ability to open the minds of kids to all sorts of art arenas, not just the convential drawing, painting, etc. Good Luck with the class; I truly hope it goes well! I think it is a great idea. If we do not teach these skills to our young people, they will be lost.I am sure with one or two of these students, a course like this will lead to a career. Not every student is meant to be a doctor, lawyer or businessman; some need their life’s work to be something that allows them to be creative and they need courses like this to help them find that out before they waste half a lifetime in a job they are unsuited for. Mary, I agree; the teaching of needlecraft in schools is a good idea. At the intermediate (junior high) schools here in NZ, boys and girls are taught a variety of ‘technology’ subjects – woodwork, metal work, cooking and sewing – but needlework as in embroidery is not taught nor is it taught at high school as a compulsory or elective module. I learn embroidery from this site and am a huge fan of your video tutorials. I wish I were a student of your needle arts classes. I am looking forward to your updates about the class. I am a relative newcomer to needle arts with formal training in fine art. The grounds are the same but the mediums are so vastly different. Stitching is tangible, eminently forgiving, and allows for immediate realization of an idea. It isn’t enclosed in a book or confined to hanging on a wall. Eve used fig leaves, but GOD fashioned the clothes. Best of luck to you and your lucky students–what a better end to their day, I can’t imagine. Yes, I do think they should be offered. But, depending on what is meant by needlearts, why put it in the Home Ec line of classes? Why not in the Art line, same as drawing & painting? Some people think of needlearts as sewing on a button or other repairs, which to me would be appropriate in the Home Ec line. Some think of decorative items such as samplers, this might be appropriate in either line. It could go in the Home Ec line if the goal was teaching how to do the stitches properly and follow a pattern, or it could go into the Art line if the goal was to get them to design their own pattern. And there is yet another group that thinks of it as painting with threads of all sorts, use whatever fibers or methods it takes to get the effect you want. Crochet and knitting wouldn’t be much different. Decorative needlework was not offered when I was in school (and that’s been a loooong time ago), just sewing. I learned some from my Mom, but most from books and practice. Well, for some reason I’m a day behind. And I see you’ve received a “few” positive responses on the needle art class idea. LOL Yes, I think it’s a wonderful thing to offer. Even if they don’t use it right away, it seems to come back to people years later and they enjoy it even more. It’s a wonderful way to be creative. My husband who recently retired has watched me stitch for years. He recently decided to try this needle and floss business. He’s hooked. 🙂 Even bought him his own Q Snaps this week. A great way to unwind after a busy day. Mary I hope you can sway the school to accept Needlearts as an elective. It is a wonderful subject and should be encouraged to teach the young so it does not become another lost art. Is there any hope of getting up a petition to send to high schools or is that wishful thinking? This is a wonderful idea. This is just as valid as woodworking or art or physical education. In a class of this type students get to learn about art and history. They can also use and strengthen their math skills. you can organize needle arts to periods in history by areas of the world. There are many ways to go about it but engaging the students to research as well as in learning the skills of needle work would be wonderful. When I took a foods of the world course I had to pick a cuisine and then analyze it using the principles taught in class. You could do something similar with needlework and when they are done have them present their results. Perhaps they have to actually make a sample of the selected needlework style. It is very exciting. I am glad to poked them into asking you to teach this class. i bet you have a full house. This is an art form and should be recognized as such. I would have loved something like this. Our art classes were limited to drawing and painting, with a little pottery. I was interested in pursuing textile arts of all sorts, and was discouraged by the lack of support, and was told that I had to ‘do art, not crafts.’ I thought my work was more ‘art’ than some of what came out of the class, but was put in the craft category along with friendship bracelets and plastic lanyards – pretty insulting to a craftsman! I hope some boys sign up! A couple of years after I finished College here in NZ. (age 13-17)the embroidery for girls and the woodwork for boys classes were stopped. I for one thoroughly enjoyed the classes and it was the teacher Mrs. Saunders that along with my mother got me started on the embroidery trail.I still have the large cross-stitch horse I did .I know from that experience with the other girls that it should be an elective.Alot of the girls hated it and would rather have woodworked. This was the only “Art” we had access to at the time. Early 1970″s. and not long after I left they introduced an Art course.Didnt get to do those years again til I went back as an adult student in my 40’s. Kids have heaps of choices these days for extra subjects and I think that the needlearts should be added to the list. Ps. I taught an art intensive day at a primary school a few years back and half my class were boys and they loved it. We had Fashion, which was a mandatory subject at my private school in Year 9 (Form 3). I didn’t continue with it, after that, as I was in the Sciene/Maths stream, but I greatly greatly appreciate the skills I learnt during that year, especially I’ve gotten older. We learnt how to use a sewing machine. I remember making a seal, which we stuffed. And then choose a Beginner’s dress making pattern and made that, learning pattern laying out etc. We also did cross-stitch, and Bargello, which started my life long love of Bargello. I did projects in it, and made/altered my own Gothic clothes, right through the next 20 odd years. It’s only in the last two years that embroidery has been my major hobby. But that mandatory class (in the 80s) gave me skills that I found useful all through my life. I would love to see an elective for needle arts. I wish I could have had that while I was in school. Would have made my life a lot easier to learn this craft. I remember in home economics there wasn’t a lot of sewing lessons…some a little wing ding of a project. Need less to say, I still do not know how to sew right on a machine, but backstitch very well. I wish you lots of luck in your adventure teaching this coming school year… I wish I could go back in time to be able to go to your class. The videos you put out for your stitches sure have made a load difference in my stitching. HUGS! How wonderful! Needle arts are a sadly neglected and disappearing skill and art form. As a 15 year 4 H teacher, I saw many kids (boys and girls) develop a passion for many such skills like bread baking, needle arts and sewing arts that are simply not offered in school systems today. These students learned math and science right along, in a fun, colorful and enjoyable way. We were always told the best way to bolster self confidence was to teach a child how to do something (as opposed to a “self esteem” class), and we saw that time and time again. When my own nephew came to live with us after failing 7th grade, with NO math or writing skills, we taught him fractions with a box of Jello. Married now, with two children, a good job and a nice wife, he still keeps in the back of the closet the sweatshirt he was “forced” to sew in Home Ec class. It was an absolute “mess” from a seamstress point of view, and that was AFTER the teacher helped him finish it, BUT, he finished it, and it was HIS. There is so much to learn from these subjects. My own daughter, now a university professor with a little boy and a briefcase full of degrees including library science credentials, started out fixing the other girls hems in the ladies room at the prom, and still sews curtains and clothes, repairs said garments as needed, along with a bit of spinning and embroidery when she has a free moment 🙂 She, to this day, says she learned more useful skills, including independent decision making, patience and “follow-through” determination, along with defending and debating her decisions, through these activities than any “regular” schooling she ever had! I would also love to see the class offered here; we’ve all learned so much from your website, with THANKS! I think Needlework Classes are a fine foundation to include in education. Teaching a child a craft that they can actually USE , relax with, be excited by and enjoy is a wonderful thing. Too many people are only consumers, needing to spend an entertainment dollar (that once spent , is only a memory, with nothing to build on). to learn about needlework broadens appreciation for what we wear, see, and touch. it sounds like a good school that would offer needlework as an elective course. I recently came across an old book by Jacqueline Enthoven on Teaching Children to Stitch. She taught embroidery in Seattle at one of the schools many years ago. Her book would be an excellent resource as it talks about what you can expect when teaching embroidery to children from preschool through high school. It would be well worth searching for this book. She also has a book on embroidery stitches which is one of my favorite stitch books. It is illustrated with examples from stitching done by her high school students. Hi Marianela, I too had a bad experience with an embroidery teacher. She would put her big scissors through my carefully stitched blanket stitch edging because the stitches were 1 thread too close or too far apart, or even 1 thread to long or too short. I was 10. At 18, I was hurt during a hockey practise and because i couldn’t play, I got bored, so 1 day I bought a stamped linen table mat and threads and started stitching again. My late Mother was my teacher then and when I finished I gave it to my younger sister. She still has it and occasionally places it on the coffee table. If her children are having drinks or food, they always remove it from the table just in case food or drink is spilled onto it. Would you care to be an email penpal? I am sure I’m late on the bandwagon for this one! The arts are not a frill. They are essential to complete education as they teach creativity and problem-solving that are necessary to anyone. Every child should be required to take a full complement of artistic classes be it music, painting, woodworking or whatever. And every child has the ability–they just need the practice. Now for the Needle Arts class. It is a wonderful idea. It’s always a little frustrating to me that we segregate needle arts, quilting, etc from the fine arts. Or that quilting and needlework can only be a fine art if it is tortured to death. Doing a great piece of embroidery requires no less understanding of color theory, composition, and technique than does any other art form. So, I say. Kudos to you! Go forth and do great things. I couldn’t agree more with Sandy. We have too long segregated the arts from the curriculum and the “practical” arts from fine arts — both things need to change. Needle arts not only provide an opportunity for creativity and teach patience and discipline, they also teach about women’s history and acknowledge the role that these arts have played in our country’s culture. I wish you the best and encourage you to continue to share your experiences! In the 1960s and 70s my high school offered needlework classes. I can safely say those classes altered my life and give me an abiding interest in needlework. We were given a fairly free reign on projects by the second year. I never had any great interest in sewing and tailoring, as my best friend did, but I went from my first petit=point project to making needlepoint samplers with stitches I found and later invented. I learned the pleasure of creating something that is my own invention, as a result of research and personal effort. Since that time some form of needlework has always been a sub-context of my life. My needlework classes, along with my English classes, have provided me with a way to cope with life, even during the times that my daily life has little to do with crafts or self-expression. Nowadays the arts and music and “inessential” things are always the first to go when a school district is short on money. I also teach a Fiber Arts class that was introduced last year in our school. The school is an small urban high school and I had some difficulty getting students to bring in materials and fabric for sewing projects. I intoduced cross stitch and embroidery and some of the girls really liked the work. It was still a challenge at times, as many wanted to just sit and socialize. I am trying some new things this year and would be very interested in hearing about the class you are teaching and the projects you plan to do in class. For many years I have demonstrated wax carving for lost wax casting at Renaissance festivals and I see so many people, principally younger people, that have no concept of actually making anything with their hands. Once crayons and white glue are left behind in elementary school, they have no notion of being creative in a personal sense. Part of my demo is pointing out that every object they have – from paper cups to cars – started out being created by a live human being. I believe that hands-on art should be taught at every level, not just for the obvious reasons of continuing traditional arts, and teaching something that will give a lifetime of pleasure but in the broader sense to put physical personal creativity back into the hands of youngsters. Creativity is empowering on many levels; it leads to problem solving and inner confidence besides the simple joy of making and creating. I can’t remember where I got the url for an archive of old old embroidery books. My computer crashed and I lost it from my favourites. I would appreciate getting it again if you have it. Thanks. Definitely remember enjoying a sewing and Chicken Scratch class(es) in elementary school!! It would be amazing if the PTA’s of schools would find members with special talents who are willing to share and teach youngsters! My mom didn’t do handwork — and only used the treadle sewing machine for hems. Children have the right to be taught EVERYTHING that is available … especially in the arts. I think these kids will find it to be a life altering experience. Being able to make something beautiful with your hands that you can call your own and can look at or give away as you please is one of the finest ways of developing a sense of self-hood. A teacher once asked me why I chose to study art, and I said I wanted to learn how to make something so beautiful that someone would want to keep it. So many kids miss out on the opportunity to learn how to make something, whether it’s simply because they don’t have anyone to teach them as they go along and so they turn to the available mediums they can pick up on their own (texting, computers, etc.) or they turn to the mediums that are more common (cooking, sports, etc.) But I find those are often transient pleasures, and there is absolutely nothing like stumbling across something that you made years later, and to know that it is beautiful and that you made it come to life, is an expression of joy made concrete. hola perdona que te siga molestando tanto deseo que me ayudes para aprender a bordar en la tecnica de Crewel , es para hacer cuadros bordados me facina bordar, , es para poder ayudarme en mis entradas , si quieres te cuento mas , contestame por favor a mi correo . your wonderful videos to watch. You do a great service to us thru all your passion for the stitches. Thanks Mary….you are appreciated. I love your website! I’ve just started teaching an adult needlework series at the library where I work. Like your class, this is the first time a series of this kind has been offered at this library so I’m starting from scratch. The first class was on beginning cross stitch. I am a DMC Mentor so DMC provided me with enough free kits for the cross stitch class. The class was exciting and very well received. Also currently scheduled are beginning needlepoint (tent stitch) and a class on beginning embroidery (various line stitches). I plan to continue the embroidery series with other types of stitches. I’m all ears for any kind of advice you can give as you progress through the school year. Thank you for sharing via this site! Hi, Kimberly! I’m so glad to hear about your teaching endeavors. Sounds like it’s going great!! I’ll be posting later in this week about the current status of my needle arts class, and my spot sampler. I’m also working up plans for next semester’s projects, so eventually, I’ll be writing about those, too! Congratulations on your wonderful work! I think it’s great!! I am adding a Needle Arts class to my curriculum next year and would appreciate any project ideas. Also, could you share your course curriculum? Ohio doesn’t have a state standard for Textiles! What a shame. I think this is a great idea. I love needle arts myself. In this modern world we are getting away from this form of art. They should offer this as a class all by itself. I just discovered your wesite and am going through it. What I have seen so far is beautiful. Just wanted to jump in and say one or two thngs. I am behind you one hundred and fifty percent about needle arts being in the school room. ALL school rooms. I hope you are very successful and that your kids appreciate what you are trying to do!! Young people today are missing out on the joy a needle and thread can bring! Keep up the good work. This is a blessing! Is this schoolhouse sampler pattern available? I would love to have it.